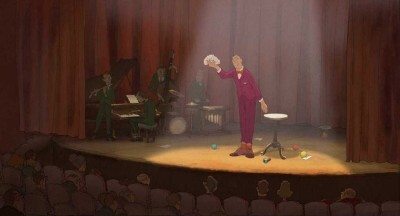 Bittersweet and often beautiful, "The Illusionist" is filmmaker Sylvain Chomet's follow-up to his acclaimed animated feature, "The Triplets of Belleville." Taking a more earthbound approach to fanciful events, the feature pays loving tribute to the work of film legend Jacques Tati, who wrote the original script for the picture in 1956. Animating his inimitable physical form into a tender story of obsolescence, Chomet captures the magic of the man, returning his lanky comedic presence to a medium that showcased his gifts splendidly, while preserving the troubled, distanced tonality of his work through attentive animation. The Illusionist is an older Frenchman still working the vaudeville rounds in 1959, traveling through Europe performing for sparse crowds, struggling to keep his profession alive. In Scotland, The Illusionist encounters Alice, a young maid in tattered clothes who immediately responds to the man's habitual generosity, thrilled with the attention. Impulsively tagging along with The Illusionist as he returns to his apartment, home to several other languishing stage performers, Alice looks to start a new life in the city, while the elder magician is confronted with confusing paternal feelings and a strained household budget, necessitating a series of odd jobs to tame. The creator of such classics as "Playtime" and "Mr. Hulot's Holiday," Tati (who passed away in 1982 at the age of 75) was an exceptional, ambitious comedic filmmaker, solidifying himself as a master of cinema through the effortless invention of only six feature films. 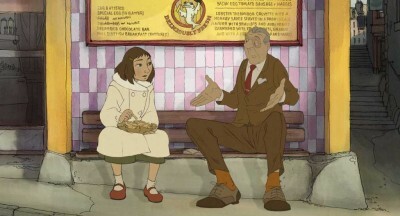 Chomet isn't stepping in Tati's footprints with "The Illusionist," but looking to resurrect his soul, dusting off a shelved script that was considered too personal at the time, brought to life here through Chomet's communicative animated vision. Preserving rubbery body language and the engaging balance of whimsy and melancholy, Chomet actually restores Tati's cinematic perspective splendidly, securing a cordial ambiance of serene clatter. A tale sold without much in the way of dialogue (what's here isn't subtitled, underlining the cultural divide), Chomet permits animated expression to accurately convey emotions, furthering the elastic, traditional look of "Belleville" into a dying age of stage performance. While a essentially a story of two opposites making an unexpected connection, "The Illusionist" is also a bleak eulogy for the vaudeville era, observing these clowns, ventriloquists, and magicians replaced by more youthful pursuits such as rock & roll and television, rendering their stage-bound talent archaic -- a grim reality contrasted vividly with the colorful outward appearance of the fading performers. The film honors the might of marquees and concert skill, feeling out the comedy of the situation, but also the depression, especially with The Illusionist himself, who faces a world that has little use for his gifts. "The Illusionist" is a somber picture, but never oppressively so. Much of Tati's droll humor is threaded into the fabric of the animation, with a few sequences of physical comedy that bring sizable laughs to the film. Without verbal communication, Chomet is free to manufacture gorgeous moments of pure behavior, creating memorable characters out of idiosyncratic movement, allowing the film an opportunity for complex sentiment and unspoken regret. It's a touching feature, but it pulls back on the schmaltz, which could be frustrating for certain viewers who prefer their waves of sorrow more cleanly defined. 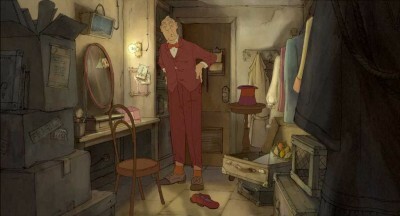 "The Illusionist" is a confident second film for Chomet, who demonstrates a skillful control over pathos. While his inspiration is unbeatable, the filmmaker manages to shape his own vision out of this tribute, using Tati's unmistakable carriage to articulate his own bewitching brew of emotions caught in a transitory entertainment era. Buy tickets to "The Illusionist (2010)" now!